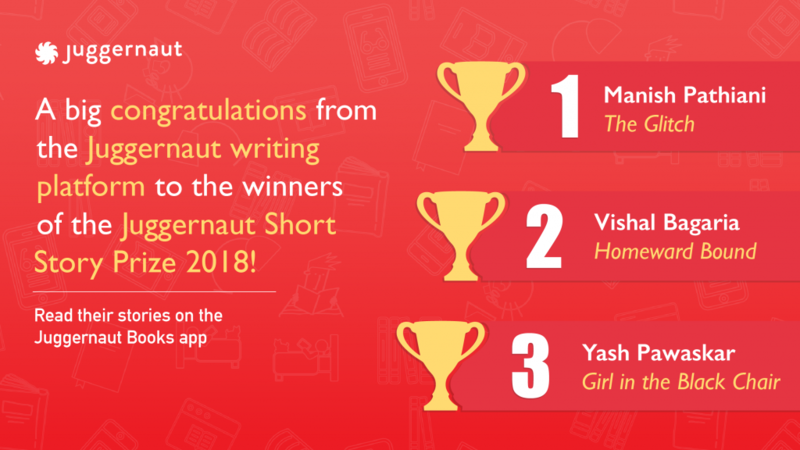 The Juggernaut Short Story Prize is an annual short story prize that runs for two and a half months and invites entries from budding writers all across India. We received not only a huge amount of entries, but also really fantastic entries which explored new concepts, wrote in beautiful language and wowed us with their innovation. Eighty percent of uploads on the writing platform are short stories, and we thought it only fair to have a prize to encourage even more of these stories. The winning entry, this particular story was the one that we found most gripping and innovative, making it seem like an episode of Black Mirror. You can read the story here . Homeward Bound was another stunning read bringing to light the ongoing refugee crisis that never seems to end, and one man’s desperate action. When hundreds of refugees land in a neutral country, out from their own after a scathing drone attack, they are greeted with the coldest welcome from the inhabitants in the sub-zero weather. As they await their passage into a new life, one amongst them shoots down every single port guard with military precision thus compromising their dreams ahead, and thereby seals everybody’s fates together. Vishal Bagaria is has written several short stories and a novel. He is a registered screenwriter as well. A voracious devourer of crime and drama mystery, he often goes on a Goodreads Reading Challenge spree. He considers JK Rowling, Vishal Bhardwaj, Jeffrey Archer among many others as his literary inspirations. He has completed his MSc. in Management from London & currently lives in Kolkata. This was such a thrilling, fast read that we couldn’t stop. Tapur sets out on a solo trip to Ladakh to celebrate her 24th birthday, but never returns. Almost a year later, her twin, Tupur is set to complete Tapur’s unfinished journey. But Tupur’s world turns upside down when she encounters the Girl in the Black Chair. Yash Pawaskar is a published author and a columnist. He works in the content industry and cleans his bookshelf from time-to-time. The best part of an editor’s day is reading all these wonderful stories that are sent to us: so never stop writing, and never stop believing in yourself.